NEWS REPORT: My blog was recently approved for The Gabby Moms, a blogging program through TEACH magazine (now known as Eternal Encouragement). As a “Gabby Mom,” I will be writing monthly reviews on various products and sharing them with you on my blog. 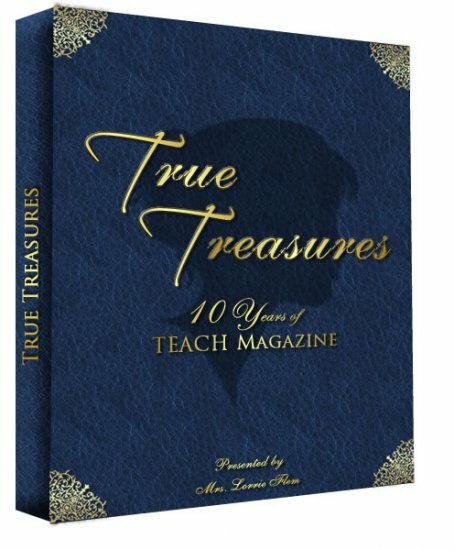 If you haven’t noticed, the chapter titles coincide with the book’s title, revealing how the articles in the book are “True Treasures.” Pretty neat, huh? But, anyway, if you are like me, it is hard to get through an entire novel in a decent amount of time. But, with this book, it is easy for busy moms to pick it up and read through one or two articles in one short sitting. There is only one thing I would possibly change about this book, and that is to maybe add a splash of color on at least some of the pages. There is a picture of a flower on most of the pages, and I think it would be so much more appealing to have those flowers in color. But, that’s just me - I’m a visual kind of person. Thankyou, Eternal Encouragement Magazine, for allowing me to review this book for you. Disclaimer: I received this product for honest review from Eternal Encouragement Magazine as a part of The Gabby Moms blogging program. All opinions expressed are solely my own. btw I LOVE your haircut...it really brings out your high check bones and beautiful smile! Thank you for stopping by my blog! Your review is excellent! I look forward to getting to know you better through Gabby Moms. What an encouraging book! Love your review. I love the title of your blog! Thanks for sharing. I agree with Jenny! FANTASTIC name! I'm a new follower & I'm a fellow Gabby Mom! Nice review! I love how cleverly the titles were written too! I'm glad you enjoyed it! Thank you for coming by to visit me at my website! Looking forward to getting to know you and the other Gabby Moms better this year. I am a new follower. I just set up the google connect yesterday because I noticed so many gabby moms had it! Have a blessed day! New follower & Gabby Mom here too :) Loved your review. Great blog as well. God Bless! This is the kind of thing I've been looking to do! Could you hlep me get started in anyway? I've been blogging for 3 years & I write reviews on my blog & would love to be a gabby mom! http://www.diabeticsnacker.com/ directorylanesuperstore(at)gmail.com Thank you! I totally missed the connection between the titles of the chapters to the title of the book... oops! Great review! Following along as a fellow Gabby Mom. Great review! It's so fun to read other point of view on the same book! Great review! Thanks for visiting my blog and leaving a comment.